Pierre has an extensive dance/fitness background and loves all types of music. His athleticism together with his dancing background provides the perfect combination to Zumba® Fitness! Pierre taught Salsa and performed Samba as well as many other dance styles at major venues including the Copacabana Club in Fitzroy. 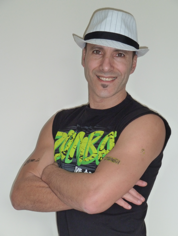 As an Zumba instructor, Pierre has a special connection with his students which generates an awesome feeling and great atmosphere which everyone can enjoy. Bringing happiness to peoples lives and encouraging them to be fit is a goal which Pierre stands by and hopes to pass on to his students. There’s no better feeling than feeling healthy and Zumba® Fitness is the answer! No matter what your experience or age Zumba® Classes are welcome to everybody and once you’ve attended one with Pierre, you’ll never want to leave! Pierre cannot wait to get you on the Zumba® train, because he know that once you’re one you’ll never want to get off! Pierre has completed Zumba® Basic, Zumba® Basic 2, Zumba Gold® and Zumbatomic®, Zumba Toning ®, Certificate III in Fitness, as well as his First Aid Certificate.